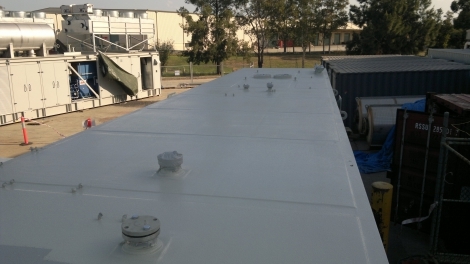 Australian Protective Coatings installed Rhino Linings 2185 to eliminate water leaking through the roof of these 12 power generators that are situated on and island off the coast of Western Australia. The Rhino coating also provides insulative qualities which provides a noticeable temperature decrease in the containers. A UV stable top coat was also applied with a slip resistant aggregate to provide safety for the workers who carry out the maintenance.